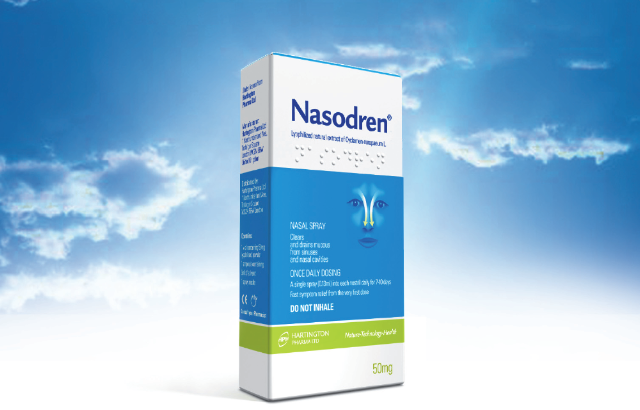 Nasodren for Sinusitis Treatment: Nasodren management in nasal polyps and cysts within the sinuses. Nasodren management in nasal polyps and cysts within the sinuses. Nasal cysts and small polyps within the sinuses are quite common (the most common being a small cyst in the maxillary sinus). In most cases there are no symptoms or problems caused by these benign structures. Sometimes, a cyst or a polyp obstructs a sinus opening and can block the drainage passageways and therefore result in chronic rhinosinusitis. Nasal cysts and polyps are treated successfully with corticosteroids alone or with surgery. Pharmacists and General Practitioners (GPs) cannot see whether a patient suffers from nasal cystis or polyposis. However, pharmacists and GPs could ask the patient about the symptoms he is suffering. If the patient is suffering from an acute episode, he probably does not have a cyst or polyps and therefore the pharmacist can recommend Nasodren® or the GPs can prescribe it. However, if the rhinosinusitis is recurrent and has lasted longer than 12 weeks, probably the patient is suffering from chronic rhinosinusitis due to a cyst or polyp obstruction. Therefore, the pharmacist should refer to a physician to determine if the patient has nasal cysts or polyps, and ensure the appropriate treatment. The GPs should recommend consulting an ENT specialist. In general, it should be noted that any nasal irrigation is not recommended for people with nasal polyps or cysts. This is because pressure from a nasal irrigation procedure can be traumatic in that the fluid stream would be pushing against the sensitive and exposed tissue of the polyp. In addition, nasal polyps or cysts can block the mucus secretions, worsening ventilation and drainage functions, and consequentlydecreasing the efficacy of Nasodren® treatment. Hartington has no clinical data, in terms of efficacy or local irritation, regarding patients with nasal polyps or cysts treated with Nasodren.